I have been back in Phnom Voar, the heart of the Kampot Pepper region, for about a month and have been visiting small farmers as well as the Kampot Pepper Promotion Association (KPPA) that represents hundreds of small pepper farmers in Kampot and Kep provinces – the only areas that are allowed to use the GI (geographical indication) mark. These pepper lovers, smitten with their product, proud of their traditional values and definitely looking into the future, are the keepers of an ancestral know-how, of a way of production where the man and his land make one with a unique goal: producing the highest quality pepper. It is truly wonderful to witness the re-birth and expansion of such an ancient farming system that will help ensure the community and economic development of an area so devastated by civil war. Welcome to KampotPepper.Gives bringing the best pepper in the world in a way that not only helps the small rural pepper farmers but helps charities, non-profits, schools and other groups to fund their work. Cambodia is a remarkable country with a rich, and in modern times, tragic history. Angkor Wat is certainly the most well known living monument in Southeast Asia, if not the world. Many consider Angkor the eight wonder of the world. Of the seven classical wonders of the world only the Great Pyramid of Giza exists to this day. Angkor Wat is an active temple, not just an archeological monument. There is another wonder of the world from Cambodia, at least from a culinary perspective, and that is Kampot pepper. If you have never tasted the exquisite yet subtle flavour of this ‘king of kings’ then you have something to look forward to. I have always loved pepper, freshly ground pepper is my favourite spice. Pepper has been called the ‘King of Spice’ and centuries ago when introduced to Europe from Asia it was referred to as ‘Black Gold’. 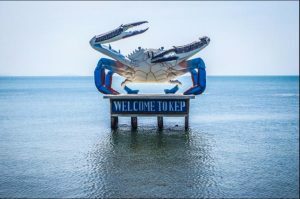 My first experience of the delight of Kampot pepper was when I went to Kep, a small seaside community on the Gulf of Thailand, famous for its crab market. 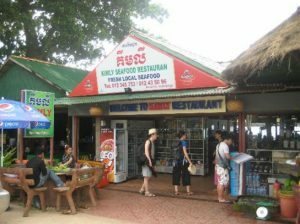 I had been told about Kimly Restaurant and that it served some of the best seafood in Southeast Asia. I was not disappointed. This began my journey into the world of Kampot pepper. In 2012 I brought back a half a kilo of Kampot pepper and began to use it in my cooking as well as freshly ground on the dinner table. Over the next few years I continued to bring back black, then the red and white peppercorns. I gifted most of the pepper to friends and family Last year I decided to try and experiment and brought back six kilos and held a fundraiser for a local foundation of which I am a member and it was so successful that…. well, the light went on. 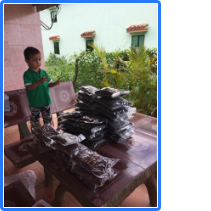 People love Kampot pepper, the small pepper farmers definitely need a Fair Trade distribution solution and so I decided to make it available on the net. Now when you buy Kampot Pepper, the best pepper in the world, you are not only helping the small pepper farmers in Southern Cambodia but you can choose a local cause to support as they get the retail portion of the sale. A culinary note: The chef at Kimly told me of a little trick he uses and that is prior to preparing his food for the day he takes a number of peppercorns and pours hot water over them and let’s them sit. He then uses the liquid and the softened peppercorns in his sauces and his pepper dishes. I tried it with sauteed vegetables, a beef stew and my favourite chicken soup recipe. WOW! What flavour! Giant crab at entrance to Kep.